Andis Lithium Titanium Foil Cordless Shaver. 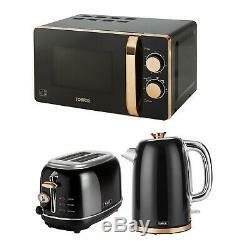 Tower 20L Solo Microwave, 1.7L Kettle & 2 Slice Toaster Set In Black & Rose Gold. Create delicious meals with this 800 W manual microwave with a 20 Litre capacity, suitable for a standard dinner plate. Six power levels including a defrost setting offers variety for your cooking requirements. 30 minutes manual timer and two rotary dials, for easy and convenient operation. Powerful 3000 W provides rapid boiling for ultimate efficiency and a generous 1.7 Litre capacity boils up to seven cups at once. Quiet boil operation, ideal for open-plan living spaces and offices. 360 degrees swivel base, suitable for left and right-handed people. Enjoy your toast how you like it with variable browning control and self-centring function for even toasting. Control the toasting cycle with defrost, re-heat and cancel settings. Includes crumb tray for convenient and easy cleaning. 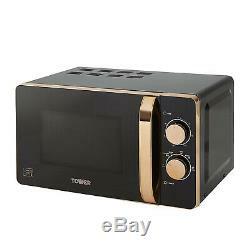 Tower 20L Manual Solo Microwave, 800W Black & Rose Gold. Packed with functionality surrounding elegant rose gold accents, this manual microwave is the ideal preparation tool for convenient cooking. Featuring five power levels and a defrost function you can tailor to a wide range of cooking requirements, with a 20 Litre capacity with sufficient space to accommodate family size cooking. The 800 W will cook, re-heat and defrost food in a matter of minutes, making this microwave a stylish and practical addition to any kitchen. 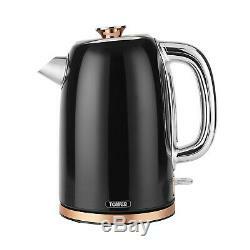 Tower Rapid Boil 1.7L Kettle, 3000W Black & Rose Gold. Boil your favourite hot beverages quickly and quietly with this 3Kw quiet boil kettle. Its generous 1.7 litre capacity lets you make up to 7 cups in one use, while its 360 degree base makes it suitable for both left and right handed users and its boil-dry protection and automatic cut-off features make it as safe to use as it is practical. 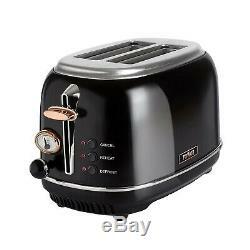 Tower Bottega 2 Slice Toaster 810 W, Black & Rose Gold. Make your breakfast routine more convenient with this stylish two slice toaster. Variable browning control lets you toast your bread to your liking, whilst the self-centring function produces evenly toasted results every time. Defrost, reheat and cancel buttons let you toast frozen snacks, warm up snacks and stop the toasting cycle midway through for ultimate ease and convenience, while a removable crumb tray and integrated cord storage let you keep your worktop tidy. 1 x Tower 20L Manual Solo Microwave. 1 x Tower Rapid Boil 1.7L Kettle. 1 x Tower Bottega 2 Slice Toaster. Surcharges will apply for N. Ireland, Channel Islands, Isle of Man, Isle of Wight, Aberdeenshire, Belfast, Co-Antrim, Co-Down, Guernsey, Jersey and any other off-shore UK Island. Ireland and any other off shore destinations. Once you place an order, you are binding into a legal contract. If you are a business you can place your order with the BuyBest UK Business Teamand pay via BACS (a minimum spend applies). Can I get a VAT receipt? Returning UK orders to BuyBest UK is really easy. We do not offer free return on change of mind or items no longer needed. Subscribe to be the first to hear about our exclusive offers and latest arrivals! 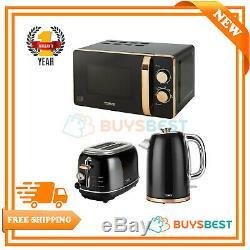 The item "Tower 20L Solo Microwave, 1.7L Kettle & 2 Slice Toaster Set In Black & Rose Gold" is in sale since Saturday, February 16, 2019. This item is in the category "Home, Furniture & DIY\Appliances\Small Kitchen Appliances\Kettle & Toaster Sets". The seller is "buysbestuk" and is located in Surrey. This item can be shipped to United Kingdom, Austria, Belgium, Bulgaria, Croatia, Cyprus, Czech republic, Denmark, Estonia, Finland, France, Germany, Greece, Hungary, Ireland, Italy, Latvia, Lithuania, Luxembourg, Malta, Netherlands, Poland, Portugal, Romania, Slovakia, Slovenia, Spain, Sweden, Australia, United States, Canada, Brazil, Japan, New Zealand, China, Israel, Hong Kong, Norway, Indonesia, Mexico, Singapore, South Korea, Switzerland, Taiwan, Thailand, Saudi arabia, South africa, United arab emirates, Ukraine, Chile.